Selling Annuity Payments, Or Surrender Annuity? What Is A Better Option When Giving Up Future Annuity Payments? Selling annuity payments is a consideration that may come up at times after you have bought an annuity contract. The reason usually is because you are desperate for the money now to cover some large expenses and would like to sell out your annuity in exchange for a lump sum. However, before you decide to sell, some consideration are worth to be mentioned to ensure that you are doing your best move in meeting your current demands. Meanwhile, if you are SURE you want to sell your annuity payments, don't hesitate. CALL ME NOW, and we'll arrange a good deal to your full satisfaction. What's Your SINGLE, MOST IMPORTANT Question? Why Are Your Selling Annuity Payments? This is naturally the first action that you are asking yourself when the though emerges to sell your annuities. The very simple answer to this is: because you currently prefer the option of liquidity and accessibility of your invested funds over the safety and security of guaranteed future payments. In other words: you pay a price for something. You give up something in favor of something else that is at the time more preferable to you. Giving up guaranteed payments, however, is only one drawback of selling your annuities or structured settlements. The next very important factor is: losing money. You will in fact get less money in the buyout lump sum than what you would be getting in the future annuity payments. This is because your lump sum will be calculated according to the present value of future payments. This may still be your preferred, reasonable and fully legitimate choice when the circumstances call for it. However, there are more factors to consider and pitfalls to avoid when you are weighing your options about giving up long-term annuity payment contracts. There is another way to cancel your annuity without selling it, namely withdrawing money from your annuity and paying a penalty, or surrender fee. The surrender fee is charged according to the terms of some annuity plans, and it depends on a number of variables affecting the obligation or amount of the surrender charges. Whether or not you are paying an annuity surrender charge may depend on the time when you are taking out the money, as well as on the amount of the withdrawal. Typically, annuity surrender fees are charged in the first 6 to 8 years of the contract (but sometimes more). The amount depends on when you are withdrawing the funds. It gradually decreases with progression of the annuity years. Thus, if you withdraw in the first year, you will be charged substantially more than by taking out money in the last year of what is referred to as the Annuity Surrender Period. So, if you are faced with the options to surrender your annuity and pay the charges versus selling annuity payments to a company that will buy it out from you and take over the annuity without you paying any surrender fees, the latter may be a better option provided that the total sum you are getting minus all the fees is larger in the case of selling the annuity than of the annuity surrender. The point is that you should not just choose one option and leave while overlooking other possibilities that may be more favorable to you. There are more considerations to be made. Are you doing a surrender in order to keep a lump sum, or your idea is to take the funds and buy another, perhaps more beneficial annuity? In the latter case, more factors come into play. You should carefully compare all the costs and benefits of one plan over the other, including all the administrative and management fees and charges that may differ between companies and between various annuity plans. Is An Annuity Surrender Better Than Keeping the Annuity? Given the fees that you will be paying for the second annuity plus the surrender charge you pay for the first one, is it still a good idea to cancel the first and buy the second annuity? Will the benefits outweigh the costs? Add to this the tax factor. A Variable Annuity, for example, may be tax deferred, that you are taxed on the capital gains of the investment later on. However, surrendering your annuity may impose an income tax obligation on the funds that you withdraw (in some cases, there are additional heavy penalties, such as for withdrawing money from your retirement policies before the age of 59.5). On the other hand, if you are surrendering your policy to buy a new annuity contract, then you can take advantage of the 1030 code allowing to transfer annuities without being a tax liability incurring on the withdrawn funds. Always, consult a tax specialist or financial adviser to help you understand the laws and figure out what option works best for your cause. In addition to considerations of fees, tax charges and surrender penalties, keep in mind that when you are transferring your investment to another annuity, the second annuity pay have higher surrender charges, or prolonged surrender periods. This means that you will have a hard time canceling that second annuity without paying more than you are paying now for surrendering the first one. If you are now at the end or after the surrender period of the first annuity, you will enter a new surrender period all over again. Furthermore, in cases where a bonus is paid out as a trade off for higher surrender charges, that bonus may amount to nothing more than the increased surrender fees, or even less. That could mean that you are not even being compensated for the higher surrender fees. It again reminds that you should pay attention to all the options and benefits that you are offered and weigh them carefully. In regard to Variable Annuities, factors such as risk and volatility should be brought into the big picture. If you surrender a policy and pay a charge, it may still be a better option for you considering all charges involved. Much of this is also relevant for selling annuity payments that has its own set of costs and benefits to be weight against other possible options. Perhaps combinations of various plans may work best for you. For people selling annuity payments, I often recommend to sell only a part of the future payments, as much as is definitely needed at this time to cover their necessities, but not to give up the whole annuity plan. This will allow them to benefit from a lump sum while maintaining their annuity plan. This way they have both the advantages of liquidity as well as the safety of annuity payments. Keep in mind that for personal injury structured settlement cases there may be no tax implications for selling the annuity payments. In this case, it is pretty clear that the option of selling a structured settlement balances out the surrender option where surrender fees are applied within the given period. Again, all options should be considered. Call now to sell your annuity payments. Get a fair deal and great service! Is It Time To Sell My Structured Settlement? 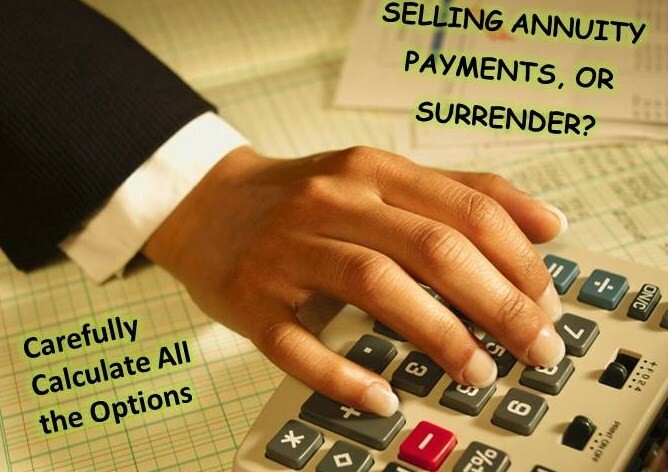 What Do YOU Think About Selling Annuity Payments and Annuity Surrender Options? Share Your Wisdom, Tell Your Story!